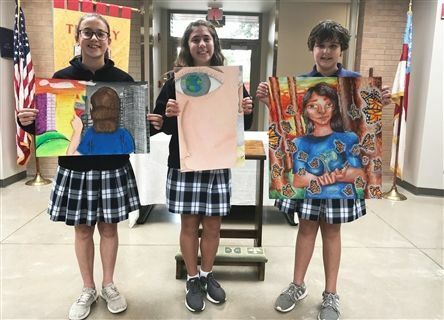 Kindness Matters was this year's chosen theme for the Lions Club International Peace Poster contest. Maria W. won first place at Trinity School for her depiction of the butterfly effect. Her piece will now advance to the city wide competition, with the possibility of advancing to State, Nationals, and even Internationals. Sutton K. placed second and Natalie S. third. Thank you to all 7th grade participants for your time and dedication to this project.